followed by spiritualists from Glasgow who attempted to cleanse the home. During this ritual, as those in attendance sat in the living room reciting the Lord's Prayer, the floor began to violently shake and clawing sounds erupted from the bedroom. 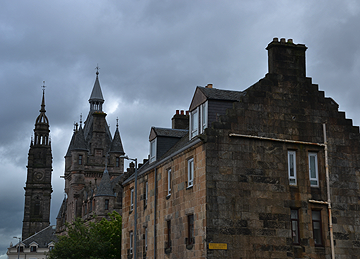 With Webster's help, Michele Kane and her daughter able to persuade Provost Tony McGlone to make the housing managers of the Inverclyde District Council relocate the family. 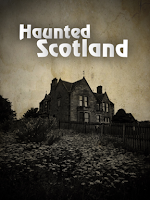 Following the relocations and exorcisms, the entity or entities haunting this woman ceased. In January of 2006, a Greenock couple reported seeing an enormous black feline in their front garden one morning. No mere house cat, this animal was rather panther like. May 2007, Two employees at Town Hall spied a man in 19th century attire in the kitchen. The man quietly exited the room, and so the pair followed. But when they caught up to where he should have been, the strange man had vanished. There were no exits through which he could have escaped. Later, the workers checked the CCTV recordings. They were startled to find only themselves in the video. There is also talk of a little boy who fell to his death in the 1800s here. It is said he can be seen from time to time wandering the building. May of 2008 saw a UFO report. The witness described a green, glowing orb that streaked an orange trail behind it as it silently crossed the sky in the east. Titanic’s Dock & Pump-House are rumored to be haunted by the ghosts of workers long passed. 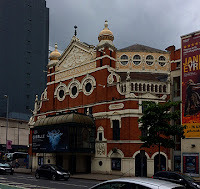 At the Grand Opera House, two stage hands named George and Harry haunt behind the scenes and actors have reported disembodied faces staring at them from the empty seats during rehearsals as well as unexplained shadows flitting about. Crumlin Road Gaol--Apparitions, faces, and shadows have been caught on camera. While only 17 people were hung here, many other prisoners are said to be here occupying every wing. The B-wing is where a famous photograph caught the face of a man in a coffin. A prison warden is also in this area and can be heard walking the halls. In the C-wing, a man walks, only to vanish into the air. And, in the D-wing, a man reportedly stands in the doorways and watches visitors. EVPs are quite common as are objects being thrown. Dating to the 1200s, Dunluce Castle on the craggy Antrim coast is an evocative ruin straight from the best novels of Irish Gothic literature. And for good reason. Its crumbling form perches quite literally on a jagged cliff face high above the tumultuous Irish Sea. And there are the ghosts, of course. In the 1500s, Lord MacQuillan's daughter Maeve Roe was to be married off to her cousin. However, she was in love with Reginald O'Cahan, the son of a Clan leader who was in a bitter feud with her father. Since both father and daughter were equally stubborn in the matter, Lord MacQuillan locked Maeve up in a castle tower until she came to her senses. Learning of this Reginald ventured one stormy night, scaled the tower, and freed her from her prison. The young lovers raced in the night to make their escape in a small boat. Unfortunately, Reginald proved no match for the tempestuous sea and his boat capsized, taking both himself and Maeve with it. Maeve still haunts the castle and the MacQuillan family, as the Banshee of Dunluce Castle. It is said that her spectral wails of misery are still heard from time to time. Another stormy night, a century later, Lord and Lady Antrim were hosting a lavish Christmas party when a horrible rumbling was heard from the north side of the castle. Those in attendance raced toward the sound and were horrified to discover that the entire kitchen had crumbled to the rocks below, taking 9 servants with it. One legend tells that the only person left standing in what remained of the kitchen was an old gypsy woman who had been rebuffed by Lady Katherine earlier that day. It would seem that this was her revenge. Still, others say it was just a tragic accident, but that those 9 servants can still be glimpsed from time to time when the circumstances warrant. Visitors have returned with tales of an unseen presence brushing past them in the Southeast tower. Staff have reported items moved around the shop or lights extinguished are found turned on when they return in the morning. 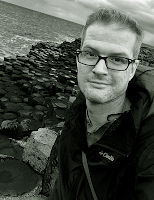 The Grey Lady that haunts the evocative tunnel of Beech trees flanking Bregagh Road between Armoy and Stranocum in County Antrim, Northern Ireland, and known romantically as The Dark Hedges (you may have seen it featured in the HBO series, Game of Thrones), is believed to be maid who from a nearby home who died under mysterious circumstances. Others say she is a lost spirit who cannot find her grave. It is told that on All Hallow's Eve, the spirits of the dead arise from their graves and join her in a procession along the lane. Baile Átha Cliath, or Dublin, as it is more commonly known, is the capital and largest city in Ireland. The earliest habitation dates to prehistoric times, but Ptolemy wrote about a settlement at Dublin Bay as far back as 140 CE. 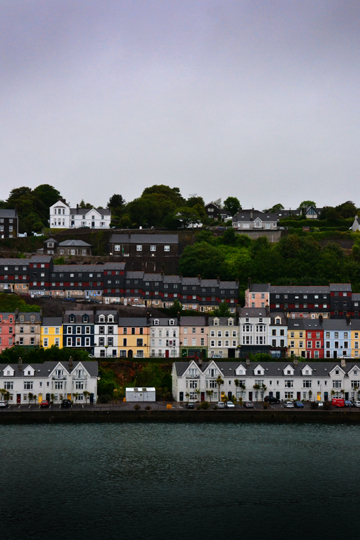 A permanent settlement has existed here in one form or another since the 600s and has been home to Celts, Norse, and Anglo-Normans. 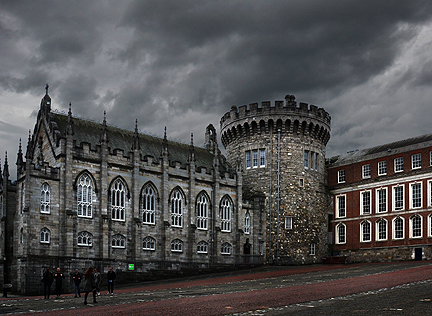 Originally, Dublin Castle was the site of a Danish Viking fortress (portions of which still exist as the castle's under croft) built around 930 CE in the settlement known as Dyflinn. When King Brian Boru overthrew the Viking occupation in 1014, the site was ruled by the Irish until 1169 when the Norman Invasion reached the shores of Ireland. 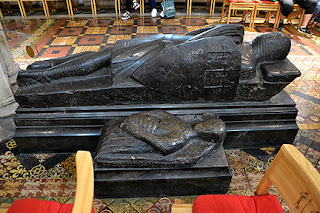 In 1171, England's King Henry II invaded in support of the Norman Earl, Strongbow. In 1204, King John of England had a larger, more imposing castle erected on the site. From here, English rule was imposed and the heads of those who dared conquer its walls were frequently displayed to discourage any further incursions. According to witnesses, some of those deceased invaders do not rest quietly. A fire in 1684 gutted much of the castle and the resultant rebuild is largely what we see today. Around the mid-1800s, a member of the Lord Lieutenant of Ireland's staff witnessed two ghosts walking through his office, chatting with each other, but seemingly oblivious to him. The pair then walked right through a door that had long ago been sealed off. Other workers in the Castle have reported similar over the years. 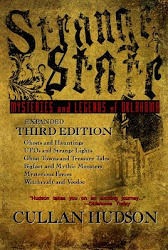 In 1955, it was reported that guards were harassed by a mischievous spirit that turned lights on and off. One guard in particular was awakened by the flickering lights to hear the sound of someone shoveling coal in the kitchen. However, when he went to investigate, the coal shovel was unmoved, there was no coal in stock, and the fire had nearly died. An elderly woman who refused to renounce her faith was imprisoned in the castle dungeon and left to starve. It is said she still haunts the ancient pile, her mournful wails echoing across time. Another prisoner starved to death was Roger de Fynglas who was imprisoned in 1316 and, as some will attest, remains there still. 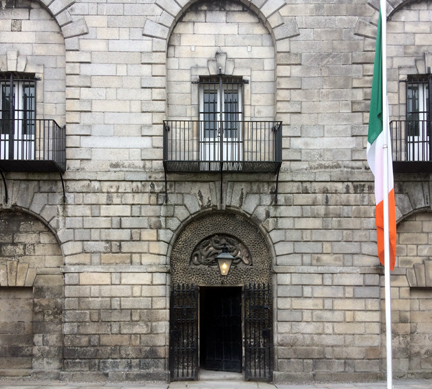 Hero of the Irish Rebellion, James Connolly may have been executed at the equally haunted Kilmainham Gaol, but his spirit is also tied to the castle where he was imprisoned prior to his sentencing. A church has, in various incarnations, existed at the site of St. Michan's in Dublin since 1095 when it served the Viking community. Its current form dates to 1686. While possessing a modest, almost negligible façade (in fact, many visitors pass it up to see the more popular St. Patrick's and Christ Church cathedrals), it is the ancient Viking undercroft that makes St. Michan's a Dublin must-see. These vaults, used as crypts for centuries, are not a big budget tourist attraction with fancy light shows and paved floors. It's quite nearly something straight out of a horror movie: Sickly bulbs make desperate attempts to reach into the darkness of the centuries to illuminate rough hewn limestone masonry, fringed in cobwebs, that slowly crumbles with the weight of age. A mantle of dust clings thickly over every surface, kicked up from the bare earthen floor or a long narrow passageway. All along this hall, on either side, the openings to small low crypts can be found. Some are gated with ancient wrought iron, others were bricked up, but almost all of them have over time crumbled open to reveal the many coffins stacked inside like cordwood. More than a few of these have rotted apart to reveal the desiccated husks of what makes these vaults so famous. The mummies of St. Michan's. The cave-like conditions of the limestone crypt have created an ideal situation for the preservation of the dead. In these vaults, you'll find some interesting characters. While some residents--like the Earls of Leitrim or the Sheares brothers, famous for their role in the 1798 rebellion--have well known stories, others are complete enigmas. 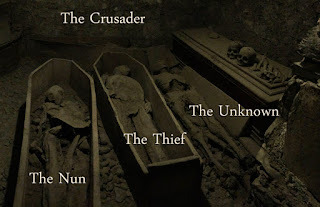 There is a woman dubbed The Nun, a 6.5' fellow believed to be a crusader who was so tall he had to forced to fit into the tiny coffin, another gentleman missing some appendages thought to be a thief, and many more who are simply unknown. And the crypts go back even further than one can walk. The corridor becomes bisected by debris halfway down and many more mysteries likely linger beyond in the dark and the death. Myriad ancient gravestones litter the churchyard above, seemingly laid out haphazardly and listing with age. 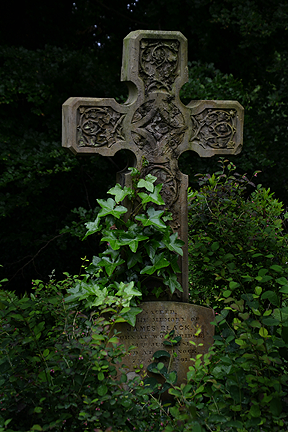 Among these can be found the grave of Bram Stoker's mother. 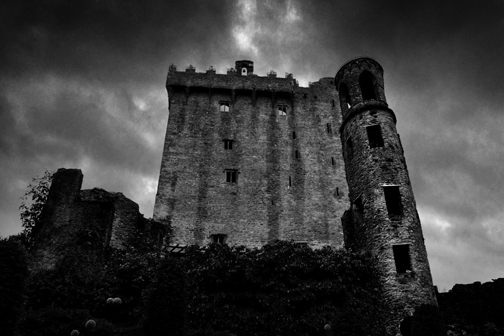 Many believe that the Irish-born author of Dracula was inspired by the church and its haunting crypt when writing that famous novel of Gothic horror. The church is also home to the death mask of famous Irish revolutionary, Theobald Wolfe Tone. 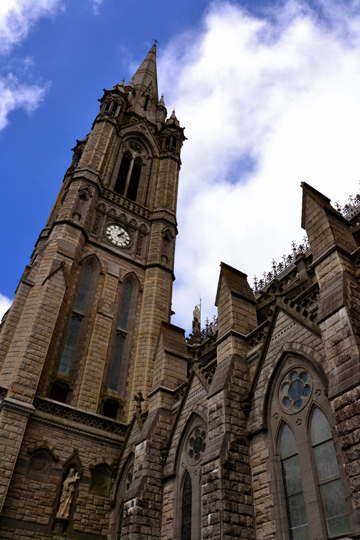 It was also at St. Michan's that Handel practiced his most famous work, "Messiah." One woman and her mother visited in the Summer of 2010 and heard a whispering coming from the unexcavated end of the crypts. She wasn't the first to report these phantom murmurs. Others have experienced this as well as the touch of unseen hands. Speaking of Dracula, you can visit author Bram Stoker's home at 30 Kildare Street. I couldn't find anything about it, but I just bet it's got to have a ghost or two. 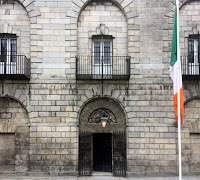 Kilmainham Gaol Prison was, like so many prisons, a place of death and despair. Several famous Irish rebels were executed here, including James Connolly. The prison was built in 1796 and shut down in 1924. It's now a museum. During renovations in the 1960s, workers claimed to hear the sound of phantom footsteps. There have also been reports of unexplained knockings on doors. Glowing lights have been seen in windows at night, long after the building has closed. 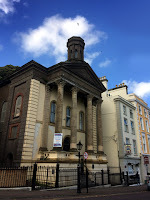 The first church on this site of Christ Church Cathedral was a wooden one built in 1038 CE by the Hiberno-Norse King Sitriuc Silkenbeard and Dúnán, first Bishop of Dublin. Later, the larger stone structure we are now more familiar with began to take shape. In 1890 the Ipswich Journal reported the sighting of "grey monks in vaporous gowns and cowls" near the ruins of the old Chapter House. According to the report, the spectacle reoccurred for several nights and was witnessesed by many. Sir Samuel Auchmuty reportedly died after a swarm of rats attacked him in the cathedral's crypt in 1822. A similar version of this tale involves an 18th century British officer who had attended a funeral at the church when he was accidentally locked in the crypt where he died. His body wasn't found for weeks, but over the years some claimed to have heard the ghostly sound of someone bangng on the crypt doors and crying out for help. It is the final resting place of Richard de Clare, 2nd Earl of Pembroke (aka "Strongbow") who died in 1176. In its crypt, you can see an array of tombs, relics, and an odd pair of mummified remains: a cat and a rat. The story goes that the cat chased the rat into the church organ where they both became trapped, died, and eventually desiccated. Author James Joyce used the pair as a simile in his famed work "Finnegan's Wake." There are also wooden stocks dating to the 1600s that were used to punish criminals. It was also home to a unique reliquary: The heart of Lorcán Ua Tuathail (Saint Laurence O'Toole, Archbishop of Dublin who died in 1180 CE). However, it was stolen from the cathedral on 3 March 2012, which seems odd given all the far more valuable items that could have been pilfered with less effort. So, why a the heart of a Catholic Saint? 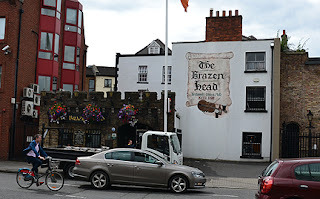 Dublin's oldest pub, The Brazen Head, dates to 1198 and is reputedly the everlasting home of Irish revolutionary, Robert Emmet, who kept rooms in this public house as a base for his resistance movement. He was hanged and behedaded just up the hill from the pub where he famously requested that his grave be left unmarked until such time as Ireland was independent. St. Patrick's Cathedral--The ghost of Narcissus Marsh (1638-1713), Protestant Archbishop of Dublin, still haunts his library in the Cathedral close, according to legend. There's an attendant--and tissue thin--explanation for his apperance, involving the heartbreak of a niece that eloped. It doesn't sound plausible. While Marsh may not have his niece, he is not alone in the vicinty of St. Patrick's Cathedral. Here, if you're lucky, you can catch a fleeting glimpse of famed Anglo-Irish author Jonathan Swift and his wife, Stella. Swift served as Cleric at St. Patrick's. You might catch sight of balladeer Michael Moran who went by the name of Zozimus in singing his folk ballads. Some say he still does, 172 years later. The most famous spirit haunting St. Patrick's Cathedral, however, is a specrtal black dog. Legend tells that after a ship wrecked along the coast, the captain's dog joined the men searching for survivors. When the captain's body was found, the dog followed the funeral procession to St. Patrick's where he remained until he perished himself from grief. Since then the black dog's ghost remains bound to the grave of his master. 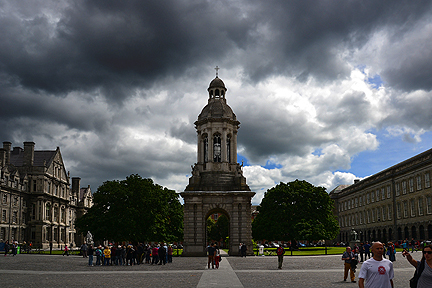 Trinity College has a storied tradition of excellence and houses several national treasures. In 1999, during construction of an addition to the Berkely Library at Trinity College, a mass grave of dismembered (mostly*) human remains were found dating to the 18th century. It is believed these were the remnants of cadavers dissected by medical students. Until the 1830 Anatomy Act, it was problematic to procure cadavers for study. There were men, however, known as "Sack-em-ups" who could find you bodies for a fee. Darkly, many of these cadavers came from men, women, and children who were murdered for the sole purpose of selling their bodies. It is also claimed that Dr. Samuel Crossey, head of the Medical School, was known for personally obtaining such specimens. It is claimed that two students disappeared under mysterious circumstances during his nocturnal hunts for specimens. Reports of Dr. Crossey's ghost being spotted walking the campus late at night surface from time to time. 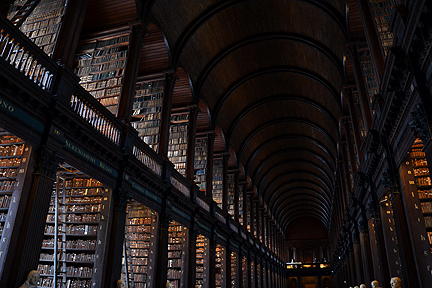 Ghosts also haunt the University's Long Room library (home to two national treasures: The Brian Boru harp and the Book of Kells), the Rubrics building, and the New Sports Hall, according to campus gossip. 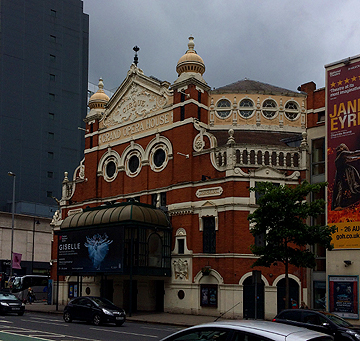 One notable tale is that of Edward Ford whose ghost stalks The Rubrics building. It is said that after a group of pranking students threw rocks at his window late on the night of March 7, 1734, he grabbed his gun and fired at the assembly. No one was hurt, but the angered students gathered guns themselves and later returned for revenge. Ford was killed in the hail of gunfire. His final words were in response to the question of who shot him: "I do not know, but God forgive them. I do." Even today, reports surface of those who have witnessed a man in 18th century attire wandering about the Rubrics at night. It's said that any student hapless enough to wander beneath the iconic bell tower in Trinity College's Front Square as it chimes will fail his or her exams. At a side entrance to the College, the Nassau Street sign has an Irish translation of “Sráid Thobar Phádraig," or Street of St. Patrick's Well. According to the tales, just beneath the left hand pillar of this entrance is where St. Patrick first baptized his early converts. *There were, oddly, camel bones found as well. 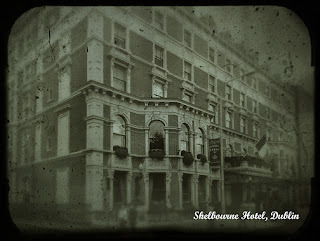 Shelbourne Hotel--Founded in 1824 when a group of townhouses was consolidated, the five-star Shelbourne Hotel sits adjacent to the lovely expanse of St. Stephen's Green. Famed ghost hunter, Hanz Holzer, and his psychic wife, Sybil Leek, encountered the ghost of a little girl named Mary Masters when they stayed in a room on the top floor of the hotel in 1965. Holzer's investgation revealed that the girl died around 1846. 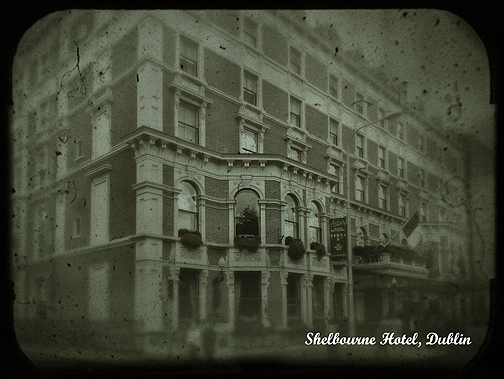 Across the street, St. Stephen's Green was once home to a leper colony as well as public hangings. Spirits of both wander its verdant expanse to this day. Collins Barracks, known as Dún Uí Choileáin in the Irish, is a former military barracks in the Arbour Hill area of Dublin, Ireland.The buildings are now the National Museum of Ireland – Decorative Arts and History. According to some museum staff, it is also haunted. The WWI soldier, known only as "the Quartermaster" silently wanders the halls of the east wing. Glasnevin Cemetery, which makes an appearance in the famous novel Ulysses is home to approximately a million graves that were often a target of Trinity College's efforts to gain cadavers for study. In fact, the cemetery has an unusual feature: a watchtower to keep a vigilant eye on the rest of the departed interred here. But not all is quiet in the ancient cemetery, and ghost tales abound. Nearby, a pub known as The Gravediggers is said to be haunted as well. Towering roughly 90 feet above its eponymous village, Blarney Castle is quintessential postcard Ireland: A large crenelated stone cuboid skirted by a landscape of velvet green, punctuated by white sheep, babbling brooks, and legend. The first iteration of the castle dates to around 1210 CE, but this was destroyed in 1446. Shortly thereafter, a new structure was erected. This rebuilt stronghold is what stands today. 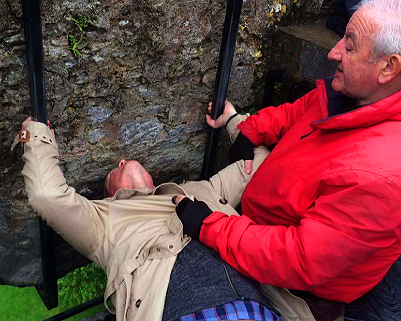 Perhaps the most famous aspect of the castle is the Blarney Stone, also known as The Stone of Eloquence. It is said that to kiss the stone will give one the gift of eloquence and persuasion. 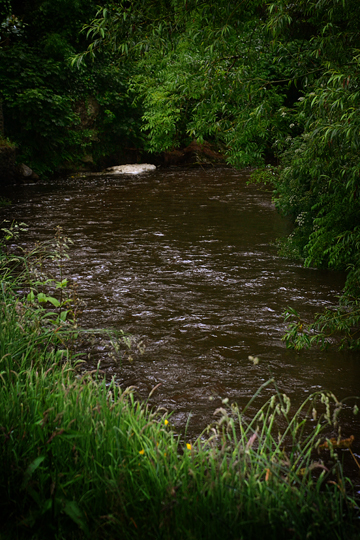 The River Martin which winds its way through the property is said to be haunted by, of all things, ghostly salmon. Very near the castle lies a copse of wizened old trees beneath which lie peculiar rock formations. Like something from fairy realms or ancient druidic rites, The Rock Close is filled with ancient stone formations like the Witch's Kitchen, the Dolmen, and the Druid's Cave. Just off the slippery, tight passage of the Wishing Steps lies a narrow shelter of rock with something of a crude chimney and fireplace. 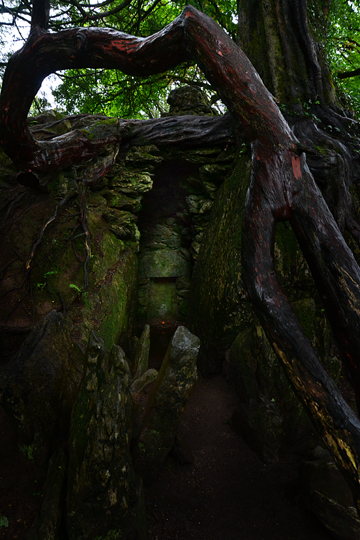 The freestanding stone nearby is said to be the eternal prison for the witch's spirit. It is said that she must grant wishes to those who walk backwards down the Wishing Steps. At night, she can emerge from the stone and work her craft at the stone hearth. Some claim you can still see the faint, dying embers if you arrive early enough in the morning. One legend of the Blarney Stone says it is she who enchanted the famous rock. Fairies are claimed to dwell within these woods, too. In 2010, ghost hunters spotted a man peering from a window in the castle. A quick inspection of the tower revealed that there were no stairs leading to where that window was. 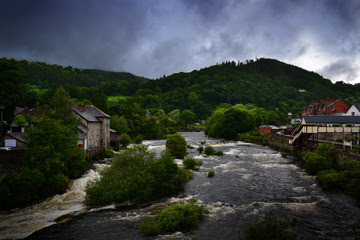 Nestled within the beautiful Dee Valley, the Welsh town of Llangollen is a living postcard bisected by a raging river and laced with Victorian charm. Towering above it all, on a craggy hillock, lay the ruined remains of Castell Dinas Brân, a 13th century stronghold of Gruffydd Maelor II, the Prince of Powys Fadog. Although the site's military history likely dates back to the Iron Age. It was destroyed in 1277 and never rebuilt, giving it a far more ruinous form that other castles that survive from the era. Yet for a castle that is these days little more than a pile of stones, legends surround it like the mists that cling thickly to the craggy hillsides. A knight by the name of Pain Peveril and his retinue sought shelter one stormy night amid the ruins. The men hadn't been there long before a giant known as Gogmagog emerged, wielding a deadly mace. Pain protected his men by deflecting the giant's fierce blows with his shield. Expecting fear instead of ferocity, the giant was taken aback—a hesitation that cost him his life. Pain stabbed Gogmagog with his sword. As he laid dying, the giant revealed to Pain that a great treasure was buried beneath the hill. Some believe that treasure to be the Holy Grail, as Dinas Brân is steeped in Grail lore by its association with King Brân. Myth tells that the castle was built by the giant king, Brân Fendigaidd, which means Blessed Crow in Welsh. During a great battle in Ireland, Brân is mortally wounded. Before perishing, he asks that he head be severed and returned to Britain. As requested, his head is severed, and his men travel across the sea to Wales. There, they live on for more 80 years as it were only a day. All the while the continually talking head of Brân entertains them. Eventually, the head grows silent and the men take it to London where it is buried within the White Hill where many believe the Tower of London now stands. It is said that as long as his head remains buried there, Britain will be safe from invaders. The Tower also has a long-held legend about its attendant crows, which many believe has much to do with the Blessed Crow himself. However, King Arthur comes along, digs up the head, and proclaims that it is he that will keep Britain safe. The Brân legend has many parallels to Arthurian legend. In the legend of Perceval and the Grail, it is the Fisher King who is the keeper of the Grail. For this reason, some believe this holy relic is buried at his castle. 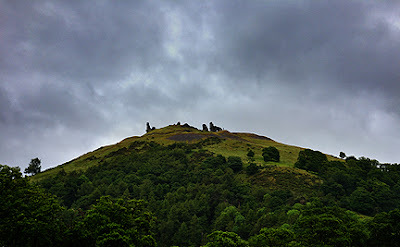 There is also the tale of St. Collen (a 7th century saint for whom Llangollen is named) who had been invited to the court of the fairy King Gwyn ap Nudd high atop the hill where the castle now stands. It was, as legend tells, a resplendent spectacle: the king sitting upon his golden throne while all around myriad fairies danced to magical music and feasted upon a bounty of food and drink. But St. Collen refused to believe the fairy illusion and so doused it with holy water. Once revealed for the trick it was, the fairies fled into the night. Fairies are thick in the legends of the British Isles, especially in Wales. St. Collen wasn't the only one to encounter their trickery. A shepherd named Tudur ap Einion Gloff was tending his flock in a small hollow nearby known as Nant Yr Ellyllon, or Goblin Hollow. While there, the Shepherd came upon a small, strange man dressed in pants made of moss and a coat of birch leaves. He was playing a fiddle while a host of fairies danced enthusiastically. The shepherd was uncharacteristically caught up in their revelry and began to dance himself. He simply danced and danced and danced all night long. As the night progressed, the enchanting creatures about him slowly revealed their truer nature. The tiny, charming fiddler was now a vile-looking horned beast with cloven hooves. Still, the Shepherd danced. He danced until his body nearly gave out. He danced until he almost died of exhaustion. Fortunately for the shepherd, his master found him the next morning and was able to rouse him, breaking the spell. There's another fairy-related story about that area. According to an account from 1817, there was once a tremendous walnut tree that grew from the rock at Llandyn Farm, on the southeast slope of the castle hill. So large and ancient it was that a local 95 year-old man said he recalled that as a small boy his grandfather told him that fairies would celebrate their weddings at night beneath the tree. And all of that is just about one hill with a ruined castle. Llangollen has more to offer in the way of legends. 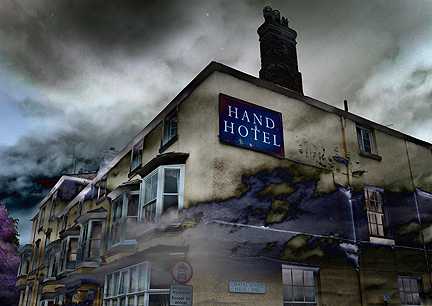 The haunted Hand Hotel dates to the 17th century, so of course it has some tales to tell. Sometime in the 1980s, a worker spotted a man in a leather apron tapping away at a barrel in the hotel's basement. He seemed so solid and real that the witness was disturbed later to learn that there was no one else down in the cellar at the time. A lady named Sara in a grey dress wanders the hotel late at night. Her brother, Albert, worked as a stable boy at the hotel before he died of tuberculosis. He haunts one of the rooms. Another room is haunted by a former employee who hanged himself there. So does his wife. She died giving birth to a child conceived during an affair, which likely led to the aforementioned hanging. There are also other, less defined spirits wandering the property. A presence is sometimes seen leaning against the hotel's organ. Others have reported the sensation of being followed only to turn around and find no one there. 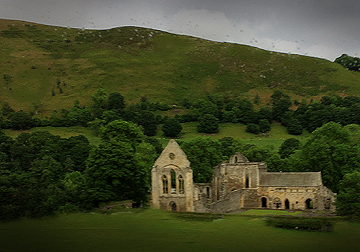 Valle Crucis Abbey is just a short ways down the road from Llangollen. It was built in 1201 by Madog ap Gruffydd Maelor, Prince of Powys Fadog. Here, spectral voices chanting in Latin have been reported within the ruined confines of the old church. Ghostly faces have been seen peering from the windows. Some even claim to have caught these on camera. Pillar's Bar in Cobh began life as a 19th century bank before arriving at its current abandoned state. Over the years, witnesses have reported doors that bang, phantom footsteps, the sound of chairs and tables being dragged along the floors, and mirrors that crack spontaneously of their own accord. Others, too, have felt the presence of some unseen figure skulking about the shadows. The Old Church Cemetery is the final resting place for nearly 200 victims of the tragic sinking of the Lusitania. Some claim to have witnessed a phantom funeral procession as well as disembodied murmurs and footsteps as you approach the cemetery. In the dockside Victorian era station that now serves as the Cobh Heritage Center, workers have reported tools mysteriously vanishing only to appear elsewhere. Shopkeepers have reported the unexplained movement of merchandise in their stores as well. The surrounding dock is also home to the ghost of a young woman in a red cape who floats spectrally through the gates. She gazes wistfully out to sea, as if awaiting some long lost sailor. The Commodore Hotel opened in 1854 to support travelers on the many ocean liners that were passing through. During World War 1, the hotel served as a hospital and morgue. Yet it does not seem to be as haunted by these poor souls as it is by the cries of a ghostly infant that has been reported on the topmost floors. 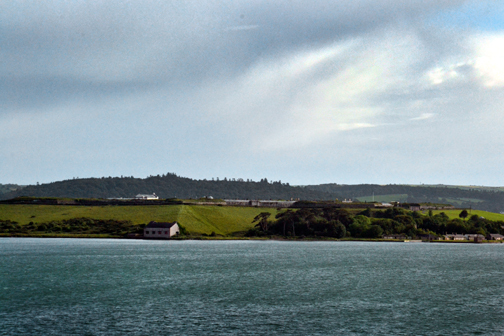 Spike Island, just offshore, began as a monastic settlement in Cork Harbor, but its strategic location made it ideal for military fortifications. In 1779, the British built Charles Fort to guard the harbor. The fort has been a prison and a youth correctional facility as well. These days, it is a tourist attraction. It is also haunted. An apparition known as the White Woman wanders the island. She is meant to be the daughter of the fort’s commander who shot her betrothed. Wracked with grief, the young woman flung herself into the sea. A sightless ghostly soldier guards the perimeter of the fort. Is this her beloved? Or the victim of the many bloody battles that have scarred this small island? Beneath Cobh's St. Colman's Cathedral, the crypts were once used as a prison, housing many children incarcerated for stealing food. If you take a history walk, you might learn that bones were still clinging within iron shackles bolted to the wall. The prison closed in 1895, but is nonetheless quite active. Additionally, a spectral hound skulks the grounds of St. Colman's, according to some. In 1942, Bernie Dahl, was walking home along Harbour Row when he spotted another man headed directly toward him. Before Bernie could react, the man walked right through him! 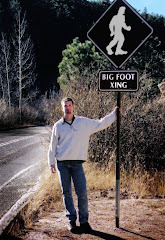 A decade later, roadwork revealed a skeleton in the exact spot where Bernie Dahl first encountered his strange apparition.